Jack A. Casey, son of Charles and Theresa. Casey, was born in Orange, Texas, on June 27, 1920. He attended Jacksonville High School where he was All-district in the District 12-AA circuit in basketball. He entered Baylor in 1939 and played freshman baseball that year. 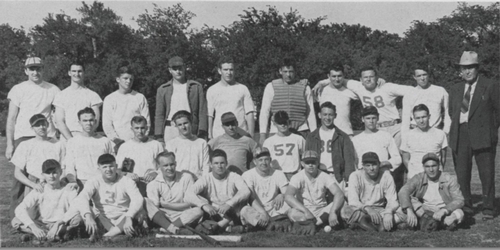 He went on to play third with the varsity team in 1941, while playing varsity football as a fullback for three years. Two of his teammates at Baylor, Jack Lummus and Joe Byrd, lost their lives in World War II. Casey graduated in 1941 and entered military service with the marines following the Japanese attack on Pearl Harbor. Serving with the 2nd Marine Regiment of the 2nd Marine Division, First Lieutenant Casey saw action at Tarawa in late 1943 and was part of the amphibious landings on Saipan in June 1944. On July 9, 1944, the very last day of the Battle of Saipan, Jack Casey was killed in action. A mother and father and their 17-year-old son stepped into the United States marine recruiting office here [Dallas, TX] today and asked permission for the son to enlist as a marine. The mother clutched in her hand a V-mail letter and a telegram which began: “We regret to inform you that your son First Lt. Jack A. Casey was killed in action in the performance of his duty in service to his country ...” The letter had been written by her son on Saipan before he was killed. So, Mr. and Mrs. C.J. Casey of Orange offered up their only other child, Kenneth William, 17, to replace 24-year-old Jack Casey, great Baylor University athlete of a few years ago, in the Pacific battle. Although the marine quota for 17-year-olds had been filled, permission was granted at headquarters for Ken, a husky football player of Lufkin High School, to be sworn in as a fighting United States marine. The older brother was a Baylor halfback in the days of big Jack Wilson, Milton Crain and Jack Lummus – back in 1939, ’40 and ’41. He left school a few days after Pearl Harbor and volunteered for the marines. Jack saw action at Tarawa and went through the first bitter slates of the Saipan invasion that started June 16. Details of his death are not available. 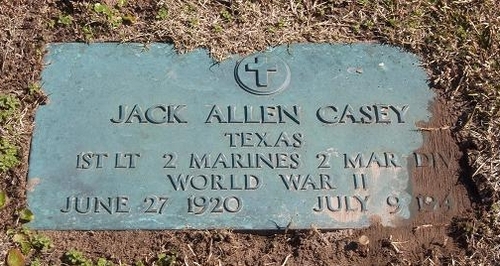 Jack Casey was originally buried in Saipan. His remains were returned to the United States after the war and now rest at the Garden of Memories Cemetery in Lufkin, Texas. Ken Casey survived the war. He passed away in 1992, aged 66.